Range expansion is a ubiquitous process across species. While the tempo of expansion events can vary remarkably, extra-tropical species are particularly likely to have experienced recent expansions in response to global shifts in habitat following the Last Glacial Maximum. Such range expansion events may directly influence the distribution of genotypes and phenotypes within a species in predictable ways. We are using these predictions to understand how molecular evolution is affected during expansion events. 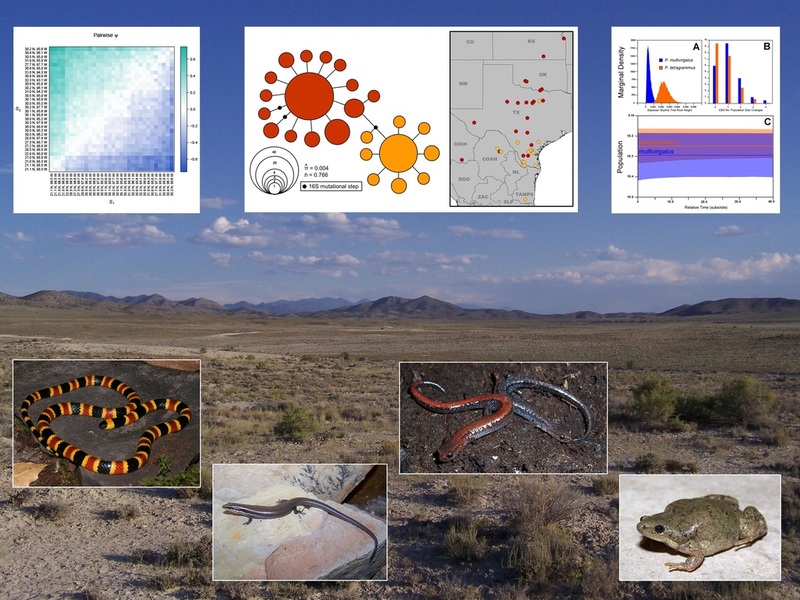 Our range expansion research focuses on amphibian and reptile species from North America. These species vary in their natural history including dispersal ability, desiccation tolerance, thermal physiology, and fecundity. Over a series of projects we will leverage these variable natural histories to differentiate species-specific and ubiquitous range expansion characteristics. Cox, C.L., Stringer, J.F., Moseley, M.A., Chippindale, P.T. and J.W. Streicher. Testing the geographic dimensions of genetic diversity following range expansion in a North American snake. Biological Journal of the Linnean Society. In Press.